Treworgans cottages are on a family run farm near Truro, Cornwall, set in 80 acres of farmland with beautiful views over the Cornish countryside and just a short drive from the seaside. I had a warm welcome from the farm dogs and I got to meet some of the guests whilst I was visiting the cottages, who had nothing but great things to say about the farm. 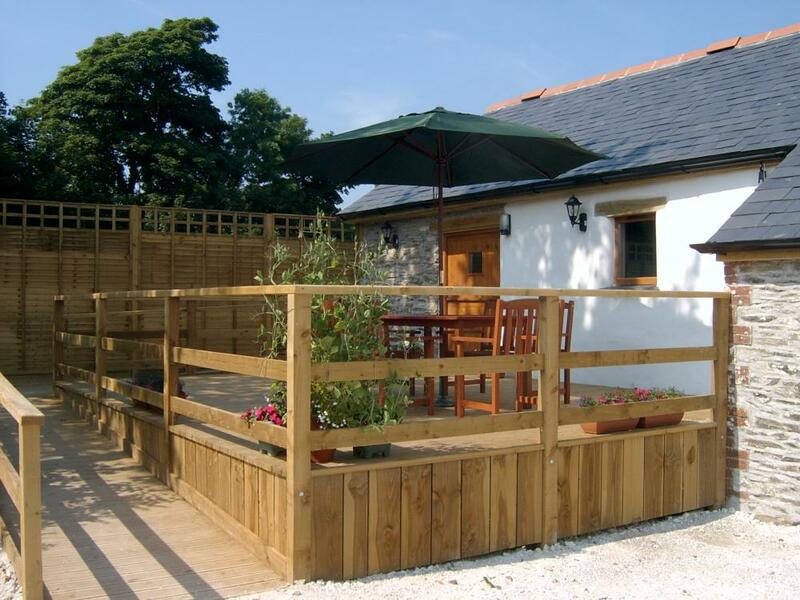 Treworgans Farm has two accessible cottages next to each other making them ideal for group holidays for up to twelve people over the two properties. Valley View sleeps up to six people and Buzzard Watch sleeps up to four people. Valley View has three bedrooms sleeping up to six people or eight people if camp beds are required (a charge of £25 extra per person over six people). It has level access from the front door with the kitchen/living room and Bedroom One on the ground level. The other bedrooms are accessed by stairs. All of the rooms can be wheelchair accessible but Bedroom One has been specially adapted with twin/double beds and a profiling bed with either an air mattress or foam pressure mattress, which can be requested in this large room. This room has an en-suite large wheel-in wet-room, raised toilet and an array of handrails. The open plan kitchen/living room has been adapted to have ample wheelchair turning space and access under the hob and sink for a wheelchair. The hob can also be lowered on request. On the other floor there are a further two bedrooms. This is a great location for people wanting a holiday in Cornwall in either one of the self-catering cottages, or using both for a group holiday for up to twelve people. Buzzard Watch has two bedrooms sleeping up to four or five people if a camp bed is required (charge of £25 extra per person over four people). Buzzard Watch is all on one level with level access from the front door. The open plan kitchen/living room has also been adapted to include wheelchair turning space in the living room and access under the hob and sink, the hob can also be lowered on request. The living room has large double doors opening onto a private accessible patio area. Bedroom One has been specially adapted with twin/double beds and a profiling bed can be requested in this large room. This room has an en-suite, large wet-room with a shower chair, raised toilet and an array of handrails. Bedroom Two is partially accessible to the more able wheelchair user and can be a double or twin with an en-suite bathroom. This room has limited wheelchair turning space. The owners have also got a large amount for mobility equipment that you can borrow, including a four section profiling electric bed with either an air mattress or pressure relieving foam mattress, riser recline chair, self propelled wheeled shower chair, two 160 kg electric hoists (you will need to bring you own sling), standing patient turner and portable alarm system, as well as lots more. For those of you that have pets they are also welcome at £10 each per week. This is a great location for people wanting an accessible holiday in Cornwall and the owners are happy to advise people on local attractions.